Support 40-bit and 128-bit encryption. Support owner and user password. Set specific permissions of PDF. 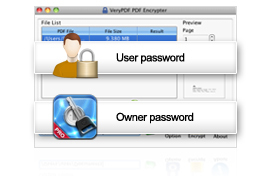 VeryPDF PDF Encrypter for Mac is developed specially for encrypting PDF for Mac computer users. 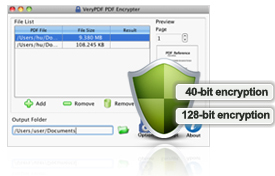 Users can choose a proper encryption security level, 40-bit or 128-bit, to protect their PDF files. It supports user password to control the permission of opening and owner password to control modifying and copying permissions. There are two security levels for encrypting your PDF. One is 40-bit encryption supported by PDF 1.3 and later version of PDF formats, and the other is 128-bit encryption supported by PDF 1.4 and later version of PDF formats. Choose 128-bit encryption will make your PDF much safer. You can set just a user password to control the opening permission of your PDF. Only those who know the user password can open your PDF. You can control the access permissions like copying, modifying, and high quality printing, with an owner password. 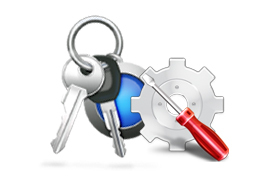 Under an owner password, this application supports these permissions, printing, modifying content, document assembly, content copying, screen reader aider, commenting, and filling form. These permissions can be controlled by an owner password separately. Support 40 and 128-bit encryption levels. Support user password and owner password. Control permission of printing PDF. Control permission of modifying PDF content. Control permission of PDF document assembly. Control permission of copying PDF content. Control permission of enabling screen reader aider. Control permission of commenting PDF. Control permission of filling PDF form.